The first time that seven-year-old Amanda meets Licorice she is trembling with a combination of terror, suspicion and anticipation. Licorice, a 23-year-old pinto mare, pokes her head over her stall door and knickers softly at the young girl. Ever hopeful of a treat, she never knows who may appear with a carrot or an apple in hand. When the horse’s huge head comes towards her, Amanda jumps back, arms glued to her sides, her facial expression stony and her eyes wide with distrust. Licorice doesn’t seem to mind. She simply hangs her head within reach of the child and waits. With gentle coaching from a volunteer and her occupational therapist, and perhaps picking up on Licorice’s kind and patient demeanor, Amanda eventually musters up enough courage to reach up and touch the horse’s velvety white and black nose. She doesn’t break into a smile, like the average little girl might do, but the volunteer does. For Amanda is not your average child—she has Aspergers Syndrome. And Licorice is not your average horse—she has 16 years of experience as a Comox Valley Therapeutic Riding Society (CVTRS) miracle worker and was named the 2012 ‘Therapy Horse of the Year’ by the Canadian Therapeutic Riding Association. With horse-to-human contact made for the first time, Amanda’s tense little body relaxes ever so slightly. A connection has been made, opening a channel for the equine assisted therapy—and the magic— to begin. 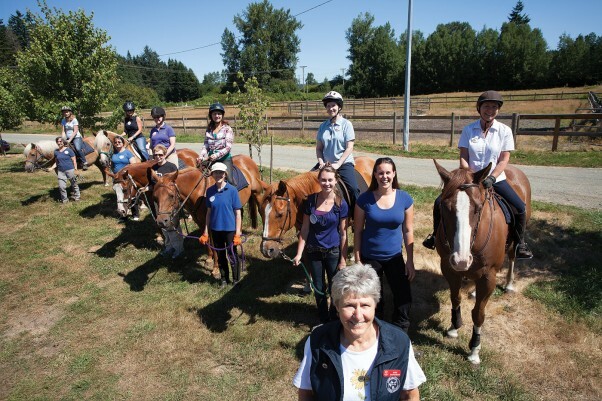 For CVTRS founder and executive director Marg Hind, scenarios like this have been repeated several thousand times since this equine-assisted therapy program was established in the Comox Valley in 1985. A horsewoman for most of her life, Hind was driven to establish a riding therapy program in the Comox Valley after attending a therapeutic riding course in Vancouver. CVTRS was created and duly constituted and mandated as a non-profit society with just a few participants. The founding members, supported by a team of enthusiastic volunteers, worked closely with physiotherapists from School District #71 and the Ministry of Child and Family Services, as well as personal aides, caregivers and other community programs. They initially focused on helping children and adults with physical challenges. This ranged from hearing and visual impairment, brain injuries, Down syndrome, cerebral palsy, polio and more. They soon expanded to include children and youth with autism spectrum disorders, specifically Aspergers Syndrome, and other learning disabilities. Six years ago, CVTRS added a different kind of therapy experience, which is what Amanda participates in, called the ‘Stable Program.’ It was created specifically for children ages eight through 11 who live with anxiety, emotion dysregulation, distress intolerance, and those who have not yet developed age-appropriate social skills. Over the years, the Stable Program has proven to be very effective in supporting these children and helping them develop appropriate skills and coping strategies in a non-clinical setting. The premise being that through the relationships the participants establish with the horses, volunteers and staff, and the confidence that they gain while learning to care for the horse and horseback riding, they learn to face anxiety and discomfort, then address and overcome it. The organization has also worked with at risk youth, young offenders, women who were victims of violence, returning veterans and many others. In this non-clinical setting, a variety of therapeutic techniques are used to help clients develop a relationship with a horse that will enable them to develop a deeper understanding of themselves. Being prey animals with an instinctive ‘flight’ response, horses are the perfect mirrors to the emotions of those handling them. To successfully be around horses one must learn to manage their own emotions in the moment, they must present a calm and confident presence that will reassure the horse that all is safe. Building emotional regulation, self-confidence and a greater sense of self is the main goal of the Stable Program. As all CVTRS programs are run in a group format, teamwork and social skills are also a focus. Added to the therapeutic goals is the idea of making sure that all the learning is happening in a fun and challenging environment. In this particular program, participants learn to understand equine behaviour and how to care for, lead and ride their assigned horses. Today, the CVTRS serves families from the Comox Valley and Campbell River and has grown to require two full-time and nine part-time employees who are supported by about 175 volunteers. They manage two stables/barns that are home for much of the year to 18 horses. Some of the horses have been donated to CVTRS, others have been purchased by the organization, and some are leased. All are extraordinary animals with easy-going temperaments that have been specially trained to work as therapy horses. The program runs from September through June and the horses take a well-deserved break for most of the summer. The administration offices and main barn are located on the grounds of the Comox Valley Exhibition (CVEX) on Headquarters Road in Courtenay. This facility is rented (at a much appreciated discount) from the Comox Valley Regional District. In addition to the admin office, it boasts an indoor riding arena and barn area with 10 box stalls, as well as several paddocks and pasture, use of the outdoor riding rings and easy access to the beautiful trails winding through the woods to the Puntledge River. In March 2012, CVTRS expanded and began renting Stonehenge Farm, which is directly adjacent to the CVEX site. The 8.5-acre facility is a horse lover’s dream come true. It has both covered and an outdoor riding arena, a barn with 10 box stalls with run-in paddocks, pasture and a round pen, as well as a house trailer that enables the full-time caretaker to live on-site. The proximity of the two facilities makes it easy to transfer horses and volunteers from one location to the other. With salaries, rent, equipment, horse feed, veterinary services and farrier care, it costs more than $375,000 annually to run the society. Funding is an on-going concern. Cooperation (and funding) from School District 71, the Ministry of Child and Family Development and the Aboriginal School Board are integral to CVTRS’ success. Significant contributions are also gratefully received from a long list of supporters including the United Way, the Children’s Health Foundation of Vancouver Island, BC Gaming, Comox Valley Community Foundation and other foundations, as well as many service clubs such as Lions, Rotaries and the Legions of the North Island, to name a few. A major coup for the organization this summer is being the charity chosen to benefit from the August 13 and 14 visits from the Royal Canadian Mounted Police Musical Ride (see story next page). The last time the RCMP rode into town with their drill team in 2009, CVTRS netted more than $50,000 in much-needed funding. Just as she had a goal to create this program back in 1985, Marg Hind, along with the support of her board of directors and volunteers, plus the parents of program participants and community partners, have their sights set on what would be an extraordinary accomplishment for this amazing organization. CVTRS wants to buy a ‘home’ of their very own. “Our lease on Stonehenge Farm expires in March 2014,” explains Hind. “To ensure the continuation of the Stable Program we are now launching a massive capital fundraising campaign because we need to raise more than $900,000 to purchase the property we are currently renting. The landowner has graciously given us right of first refusal. We are busy applying for grants, we have produced a fundraising coupon book, and we hope to generate in excess of $50,000 from this year’s RCMP Musical Ride ticket sales, raffles and food concessions. Purchase a membership. Just $15 for individuals and $30 for groups. • Attend the RCMP Musical Ride. • Buy a coupon book. Just $20 at participating local businesses. • Make a personal or corporate tax-deductible donation. • Make a donation in memory of people, pets or horses. • Participate in private lessons, ladies days, summer camps and other events at the barn. • Help with the Capital Campaign. • Call to ask how you can volunteer your services. For more information on the Comox Valley Therapeutic Riding Society visit www.cvtrs.com or call the main office at 250-338-1968. As a volunteer with the CVTRS, it gives me so much pride to see the amazing work that the society does. I’d like to tell you about an incident that resonated so strongly with me soon after becoming a volunteer. Mary was riding a horse who, as with most horses within the society’s programs, was extremely sensitive to its rider’s moods and emotions. I was leading and Mary was learning the basics of how to make the horse start, stop and change direction. During one of our classes, “Mary” suddenly burst into tears and said that she didn’t want to ride anymore. She was quickly dismounted, by the riding instructor, and left the arena to have a private conversation with the program counsellor. I was horrified that perhaps I had done something to upset her and so surprised as she seemed to be very confident and was riding so well. When I asked the counsellor later what had happened, I learned that Mary was upset because she had “told” the horse to go in a particular direction but the horse had ignored her. I still didn’t understand, until Mary’s counsellor explained that Mary was a victim of bullying and harassment at school. She had tried to tell her parents. She had tried to tell her teacher. She had tried to tell her principal. Nobody had listened to her and nobody had understood her fear. When she asked the horse to change direction, the horse didn’t listen to her either and, for Mary, that was the final straw because here she was – yet again – in a situation that she could not control and where she didn’t feel safe. At Mary’s next riding lesson, she was taught how to use body language, breathing, voice tone and weight balance to control the horse’s response to her needs and direction. She learned to assert herself and create the boundaries necessary to form a respectful relationship between herself and her horse. The horse responded and Mary learned new lessons on how to make herself heard, both in the riding arena and in her own life. This is just one example of the magic of the CVTRS programs. To tell the rest would be to write a book. Thank you so much for sharing this information. Reading on this article makes me realize how exciting it is to try on this equine therapy. Having those horses guide their clients and helping them to get back their old self or even to become a better person is really a big thing. I do hope that Mary will in time knows how to assert and will be confident as well.